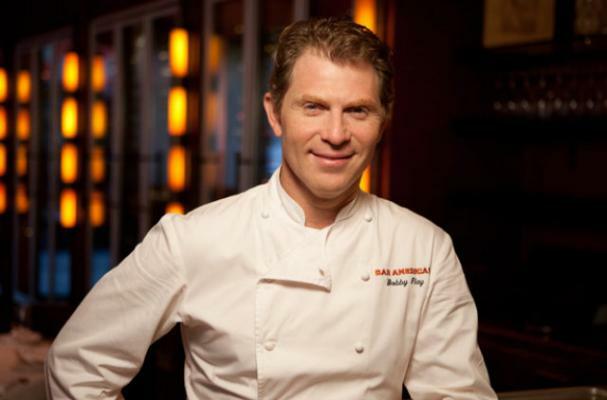 Bobby Flay is one celebrity chef that likes to lead and promote a healthy lifestyle. He is gearing up to share his own healthy lifestyle tips in a new web series, Bobby Flay Fit. To get a little preview of the show, Flay recently shared some of his own healthy eating habits. The chef is pretty strict about what he eats for breakfast and lunch, but there are no holds barred when it comes to dinner. "I eat Greek yogurt with berries and honey for breakfast, a salad or half a sandwich for lunch and for dinner, that depends -- it could be anything from a 10-course restaurant dinner to a home-cooked meal of roast chicken. I tend to be stricter with my breakfast and lunch than with dinner." Flay also shares some tips on how anyone can start eating healthy -- rid your house of all junk food, make and eat dinner early and control your portions. Bobby Flay Fit premieres on January 14.